Just in time for National Pet Day (a mere 24 hours after National Siblings Day), Damian Dibben has crafted a list of dogs who have influenced—perhaps more than we realize—the core of Western literature. Writers love their dogs. Anton Chekhov was devoted to his all-conquering she-dachshund, Quinine, named after a painkiller of course. Thomas Hardy’s Wessex was allowed to roam the dining room table at dinner, as well as tuck into a succession of houseguests and postmen. And many writers (including myself) love dogs so much that they create unforgettable canine characters in their novels. Dogs can be partners in adventure, or in crime. They might be humorous, philosophical, haughty or naughty. They’re often wiser than their two-legged companions—and are always in it to the very end. They can reveal the soul of their comrade, or be their soul. The world of humans is complicated: It can be cruel or nonsensical, relationships can be messy, but the loyalty of a dog is always guaranteed. 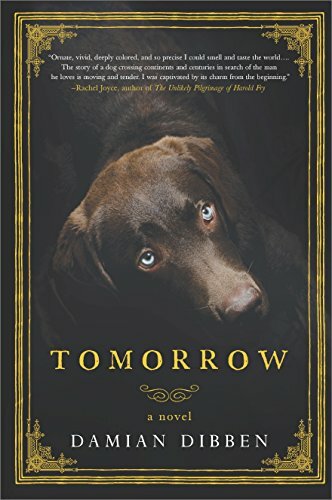 In Tomorrow, our canine narrator—217 years old and as erudite as you’d expect—must search through the gilded courts and brutal battlefields of Europe for the man who granted him immortality. It’s a story of love that spans the centuries, of courage as the world collapses into war, and of the unbreakable bond between two souls. Going all the way back to Homer, storytellers have explored the special relationship, “that purest of bonds,” between a human and their dog. Here below are my top six dogs in literature. From Homer’s The Odyssey, Argos is perhaps the original faithful hound. Having been cast out of his home, he waits twenty years for his master to return from the Trojan wars. He’s neglected, lonely and half-starved when Odysseus finally appears. But the soldier is still in disguise and cannot greet his beloved hound. Argos understands and has the strength only to sway his tail, drop his ears in happiness, before dying. Heartbreaking and life-affirming at the same time. Lord Byron loved animals. As an undergraduate at Cambridge, when rules stipulated he couldn’t keep a dog in his rooms, he took a bear instead, even enrolling the animal as a college fellow. At other times in his life he had a pet fox, a badger, monkeys, parrots, perhaps even a crocodile. His greatest love however was for his Newfoundland, Boatswain. When the animal was struck down with rabies, Byron nursed him, unafraid of being infected, and when the dog died, Byron entombed him in Wanstead Abbey and wrote “Epitaph to a Dog” in his memory. “Beauty without vanity, courage without ferocity and all the virtues of men without their vices.” In his will, Byron left instruction to be buried alongside Boatswain, but the authorities—the type of bureaucrats he’d confounded all his life—denied his wish. Bill Sikes, in Oliver Twist, is one of Dickens’ most violent creations and his companion, “his face scratched and torn in many places,” seems to be his canine equivalent. For all their viciousness though, they’ve both had terrible upbringings and depend on each other. When Sikes meets his end, Bull’s Eye goes after him across the roofs, falling to his certain death. To the end, they were two souls that would not be parted. Not only does Herge’s Tintin have a gang of fantastically eccentric friends and travels the world solving grand mysteries, but he always has Snowy at his side. Resourceful, resilient, and partial to the odd snifter of whiskey, the fox terrier—an unusually pure-white one—saves Tintin numerous times, and vice versa. Snowy is dog through and through, he sniffs, tracks, bites when required and loves—above all else—bones. He also has a sense a humor, a nose for caution and a passing interest in mechanics and geography. He doesn’t speak, but his thought bubbles are prolific, as he wrestles with conundrums of right and wrong—usually involving a choice between a bone dinner and saving the world. He’s loyal to the core and when, in The Shooting Star, Tintin temporarily abandons him, he is inconsolable. Fang is a boarhound and one of several “challenging” pets owned by adorably gruff half-giant, Hagrid. In Harry Potter, his great size is matched by his clumsiness, prodigious slobbering and titanic lack of courage. He accompanies Harry on a foray into the forbidden forest, only to turn and run at the first fright. Not every magical creature can be a hero, not even the canine ones. But we love them all the same.